Got a gift from Abbie in Arizona. Prickly Pear Vodka. She says, “prickly pear alcohol was used by Native Americans in special purification ceremonies.” I’m sure the evolution to become vodka took awhile. I got a pair of shot glasses too *Mahalo Abbie* and I got out a third for me, Mike and Glennon to sample. I don’t think they cared for it, I thought it was interesting. It definately has a different taste to it. 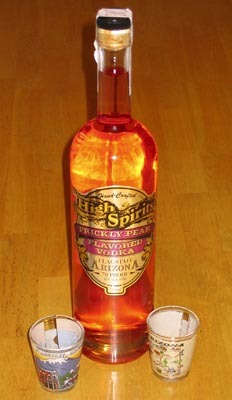 I’ll have to try a Prickly Pear Vodka Martini sometime. 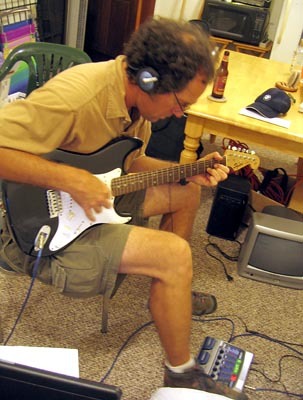 Mike gives my Strat a try via my effects pedal. Psssst…it’s also Mike’s birthday.